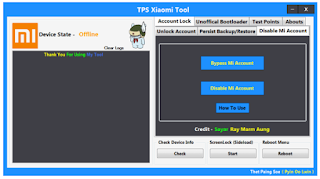 Tps Xiaomi Tool a free tool for Xiaomi mobile phone users who use this tool to easily remove their FRP locks from their mobile phones. This tool is avail free for the users of Xiaomi who uses android mobile phones and tablets. TPS Xiaomi Tool is only for the Windows operating systems to run this software you need a windows based device or a PC. With the help of this tool, you can easily remove or unlock the Mi account from any of the phones the tool has full support for the Qualcomm and SPD based mobile phone devices. To remove the account you just have to select your mobile phone model on the software and just click the start button and the tool only takes few seconds to remove the unlock all kind of locks from the selected model. This is the full and final version of TPS Xiaomi Tool which easily helps you to get rid of the locks of your mobile phone device. If you are also facing the Mi account removing problem just install this software on your windows PC connect your phone and start serving your phone. 0 Response to "TPS Xiaomi Tool Google Account Removal Free Download"